Our van is on a quiet plot, close to all amenities, and 150 yards from a beautiful pool with lifeguards, a 5 a side football pitch, basketball and tennis courts. The van has a washing machine, two fridges, air con, a small freezer, a TV and DVD player with English films and books available. We are situated in an oasis of greenery extending for 25 hectares, keeping the van cool, but giving many opportunities for sunbathing on our sunbeds, chairs, or hammock. There is a supermarket on site with a shop which sells English newspapers, a pizzeria, a separate restaurant. The pools are beautiful with two of them heated under a covered recreation area, which includes slides, a steam room and jacuzzi. The sports team arrange football, tennis , basketball, volleyball, table tennis and other family tournaments. At night the shows are fun and the disco is very popular with children and young adults. Parents can enjoy a drink on the terraces as their children enjoy the entertainment on a safe site. We purchased the property in Frejus after many years of renting ourselves, and our 3 children wanting to return year after year. We chose this site because it is perfect for all ages, and the area has all the amenities you could ask for, including spacious and safe sandy beaches. With my wife being a teacher, and myself being a Headteacher for more than 20 years we have been able to enjoy many weeks each year in the area. At the time of purchase you could choose your plot. It is one of the most spacious, in a quiet area, with plenty of tree cover to keep it cool. The mobile home is one of the best makes and it was spacious. We added the terrace as we knew guests would want to be outside. We are constantly updating furnishings with new flooring and garden furniture in 2015. The bathroom has a shower with perspex door, sink and toilet. The shower has a deep tray which can be used to bath a small child. Clean, quality, shower blocks are close by. We provide bed linen which is prepared for you in April, May, June and September. July and August linen is left for you. The washing machine is found in the outside shed. A washing line is found around the back of the mobile home. In the case of rental in April and early May there are two electric heaters and the air con unit gives heat. Plenty of parking space for two cars. This is available at a cost of 20 euro per week. Towels are provided for each person plus two beach towels. A free to use Fully equipped gym with free weights and machines. Daily fitness classes also available free of charge on site. The lounge is open plan with a table and chairs for the rare occasion when you will eat inside. The seating is around the outside of the van with the television, DVD, CD player, and books in a unit. There is a sofa bed which can sleep one adult. air con. One fridge in van, and one on the terrace. Our van is home from home. The kitchen has cooker, with oven, grill, and four hobs. There are two fridges, one inside and the other under the covered terrace. The freezer is small and kept outside. The washing machine is outside in the small shed. Most dining is enjoyed outside on the terrace where the electric barbecue can be used. The covered terrace protects from the sun and rain. There is a table and chairs for all the family to eat inside. A small TV is in the lounge with French channels. DVD is in the TV unit. A games room is available for your use at La Palmeraie, 250 metres away. Pool tables can be found at both complex bars. A small selection of films available. The mobile home is in a beautiful landscape of Palm trees and other exotic plants. The terrace is 26 feet long and has steps going up to the raised area. A three feet fence gives you privacy and safety. The terrace has plenty of lighting, including a Star Trek like led lighting. It is possible to have a sun, sand and ski holiday as Isola 2000 is 90 minutes away. Four courts are available. Booking required during peak season next to the gym. Valescure is a golfing mecca with two 18 hole courses and a 9 hole with practise areas, and everything that goes with a golf centre. This is 15 minutes from the home. There are 2 other 18 hole courses a similar distance but in different directions. Cannes is less than 30 minutes away and more courses can be found in that area. La Baume area has a sauna. There are at least six pools on the site. Two of the pools at La Baume are heated. Pools at both La Baume and La Palmeraie have water slides. This can be found at La Baume pool area. Notes on accommodation: There are two electric portable radiators and a gas fire in the lounge. The camp site is safe, and ideal for children of all ages. There is plenty of room on the plot for paddling pool etc, and for erecting play tents. There are portable fans and an air conditioning unit. Wifi can be purchased at 20 euro per week per device. Outside: The plot is large for a mobile home, 40feet x 40 feet, with plenty of room for sun beds (2), reclining chairs (2), a hammock, or simple chairs. There is a small electric barbecue which rests on the outside fridge where you can cook with your guests. Real flame barbecues are not allowed. There are window boxes and tubs, which we hope you will water. The setting of the site is natural and beautiful, where water is at the heart of the environment. There are 5 outdoor pools, one of which is heated, six flumes and jacuzzi, and a covered recreational area with 2 heated pools, flume, steam room and jacuzzi. The total of safe bathing area with lifeguards is 1500sq.m, all of which have a bathing area bordered by a shady grove of palms. There is a fitness room with instructor, four tennis courts with weekly tournaments, a 5 a side pitch with regular competitions, sand volleyball area, archery, pool games, nightly disco, regular shows, and bands to entertain you. www.labaume-lapalmeraie.com Utility Room: The terrace acts as a utility room where you can place the electric barbecue, prepare your food, and relax at the same time. Cleaning / Towels / Linen Linen, towels, tea towels are included. There are plenty of blankets. The van will be checked prior to your departure and is expected to be left clean ready for the next visitors. Other: The terrace is the outstanding feature of our home. There is good lighting all around, and enough room and seats for 12 people to eat on the terrace. The van itself is modern design. with higher than normal ceiling in the lounge. Please water the plants! We had a lovely holiday. Mike and Viv were brilliant hosts and nothing was too much trouble. The mobile home was specious and on a large quiet plot. We appreciated the extras like a second fridge and small freezer. There was plenty of outdoor furniture and the wooden deck was a lovely place to eat. The double bedroom had plenty of space and a very comfy bed. The site itself lived up to the photos with six swimming pools available. It was a nice change to know everything was included apart from wifi charges. Although we did not have children with us it was a great place for a family holiday. The staff on reception were great and very helpful. We are sure we will go back some time. Thank you for your comments. It is important to us that people enjoy the van, the site, and the beautiful area. We look forward to seeing you again. Lovely mobile home for a family holiday. We have stayed here at Easter for the last three years. The mobile home is delightful, well maintained, spotless and well equipped. The owners are so welcoming and friendly. The mobile home is set in the calm of the forest very close to one swimming pool and easy walking distance of another. The campsite has a lot to do for the children, pools, playground and a packed programme of entertainment. The staff are very friendly. You can drive easily to the lovely beach and port in Frejus and the parking is free. A lovely place for a sunny, relaxing family holiday. Thank you very much for your review. We look forward to welcoming you next year. Brilliant property on a fantastic family site. Had everything you could possibly need and the owners were an absolute pleasure to deal with. Plenty to do on site with good facilities - sports, entertainment, kids club, playground and pools. More to do in Frejus too with loads of activities, beaches, shops and restaurants. Property was perfect with plenty of home comforts and we really enjoyed our stay, would love to go back again! Thank you for such a positive review. We are pleased other families can enjoy what we believe is the best area, site, and plot to enjoy precious holidays. I cannot recomend this mobile enough. Mike and Viv are such easy and helpful people to deal with. The mobile is extremely comfortable and clean. It is in a great location in terms of the campsite, being close to both ends of the park. It is also well shaded and away from the busier routes through the site. This made it great for the kids to be able to play outside. The mobile comes into it's own with all the little extra's like the second fridge and the freezer, washing machine and BBQ. Best of all was the covered deck which was great. We were able to have breakfast/lunch outside whilst being able to keep the little people out of the sun. There is great pride taken in this mobile, and you can see where things are constantly updated and improved by the owners. Thank you so much for your comments. Providing happy holidays for families like yours makes it worth all the work and care we put into the mobile home for friends, family and guests. We do try to provide the extras we know families benefit from, which other traditional camping companies do not offer. We have been to this fantastic caravan for the last 4 years because it is such a wonderful family holiday spot. The van itself is lovely for our family of 4 and our daughters have enjoyed every aspect of the facilities on site, especially the swimming pools and splash park. We enjoyed venturing out to the beaches close by and swimming in the safe seas. The campsite restaurant serves fantastic food and is very family friendly. Thank you for your positive review. Returning year after year speaks for itself. Great location and adored by our grandchildren. The restaurant at La Palmerie was loved by us all and reasonable prices. We rented the owners house as well as the caravan for all our family as they are only 8km apart. Owners lovely,genuine and helpful people, both properties spotlessly clean and pristine condition. Will definitely stay again and already booked for next year. Many thanks for such positive comments. We are delighted all your family enjoyed our villa and mobile home. It is ideal for an extended family with so much to do in a beautiful part of France. We were pleased you were able to enjoy the peace and tranquility of the villa whilst your family enjoyed the more active environment at Camping la Baume. There are many beaches in the area, with St Raphael and Frejus 10 minutes away when the roads are clear. St Tropez can be accessed by boat from St Raphael, or St Maxime in the summer. The roads are very busy in July and August. The famous corniche is well worth the drive following the coastal path all the way to Monte Carlo, or even through to Italy. There are many pretty inland villages worth a trip by car. Port Frejus is worth an evening visit, and Port Grimmaud is further but worth a visit. It is very useful to have a car, but there are buses which wait outside the site. Many visitors do not leave the site as there is so much to do. Nice Airport is 40 minutes away, with Marseille about 90 minutes. The TGV goes to St Raphael from Paris, and a new route from London to Avignon and on to St. Raphael is available, check TGV and SNCF sites. The car or a train is a possibility, but the journey from Calais on the peage (paid motorways) is 10 to 12 hours. The site is 3 miles from the sandy beaches of St Raphael and Frejus. 25 miles form Cannes, and 40 miles form Nice. We are 16 miles from St Maxime where you can catch a regular boat to St Tropez. The golf at Valescure is 5 miles away and the beautiful bay of Agay is a further 2 miles. The train station at St Raphael is 4 miles. The local Carrefour, the equivalent to Tesco is 3 miles away, where you can find many other shopping outlets. The traditional markets are found in all the local areas. Restaurants are available on the camp site, which is reasonable, there is also a snack bar and pizza bar, but the promenade of Frejus and St Raphael are the most popular eating places. We like Roma on the Frejus/St Raphael border, where in the height of summer you will often hear a group playing nearby. Port Frejus is not far away, where many restaurants specialising in sea food can be found. The fireworks at 10am are a bonus at week ends. The reception area is open 24 hours and is very helpful. The camp site shops are good and the bread and croissants from the supermarket are popular in the morning. We have 2 bikes which you can use to ride if you do not fancy the 10 minute walk from the mobile home (please check the brakes etc before using the bicycle, and do not use it on the main roads). Banks can be found in the Roman town of Frejus, and ATM's are available. 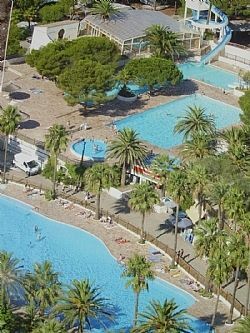 There is an Aqua park in Frejus by the beach ( 3 miles), and hire of pedalos, canoes can be found on the beaches. You can also hire the speed boats for water skiing or paragliding. We would recommend a boat trip to St Tropez from either St Raphael or St Maxime. Walking along the sea front of Nice and Cannes are always a great experience, and a night at the Hippodrome in between Cannes and Nice for pony and trap racing is good fun. A good meal can be bought in the restaurant with lovely views out to the sea across the race circuit. Entrance is about £5. Shopping is available in many areas but there is a Gallery Laffayette in Nice at Cap 2000, next to the airport. If you would like to venture further afield the Gorge de Verdon ( 90 minutes), which is inland, is impressive, or you could travel an hour into Italy, through Monaco and the Victorian style town of Menton for the Italian market at Ventimiglia, or a little further to St Remo. Booking Notes: Deposits of 25% must be paid to secure the booking and final payment must be paid 40 days prior to arrival. There is a £200 security deposit which is returned one week after departure. The security is to be used if the mobile home is not clean on departure. Changeover Day: Changeover day is Saturday during July and August. Please leave the mobile home by 11am and arrival should be after 4p.m.There is greater flexibility of arrival days during other months allowing for cheaper flights to be arranged. Notes on prices: Prices are for the property per week in UK pounds or euros.